Nha Trang was 105 kilometers away, and my German-speaking host had indicated that the winds picked up in the afternoon, so I set my alarm for 5:30. I was on the road by 6:40, and the wind situation was already not looking good. Actually the wind was hellish. Along the road heading north were a few of those small Texas-style windmills -- designed to pump water. Their blades were spinning furiously. This was bad! I kept my mind busy trying to figure out how to measure this headwind. I spit to the side, seeing how far back it landed. It didn't. I was miserable. Pressed against the mountains to my north was a thick whitish-gray cloud mass; a weather front, I guess. I snapped a photo, but I knew that this picture didn't do justice to my state of despair. I worked out a solution to this whole fiasco. The town of Cam Ranh was somewhere just beyond the halfway point to Nha Trang. 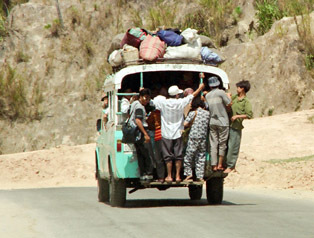 There I'd catch some sort of transportation to Nha Trang. I'd chill there for a day or two, then catch a train or something north to the DMZ. 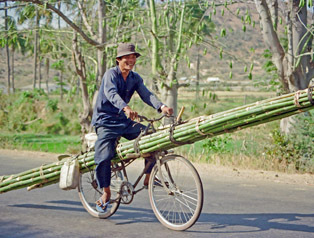 From there I'd bike south, with the wind, to Nha Trang. Nha Trang was a big enough city that I knew it would be easy to get back to Saigon, and I'd still sort of be able to say that I'd bicycled from Saigon to the DMZ. I made it to the turnoff towards Cam Ranh Bay by 10:30 a.m.. That made no sense, since it seemed like I had been in a wind tunnel for hours. The wind had died down awhile ago, though. I pushed on. I wasn't interested in figuring out how to use the public transportation in this small dusty town, and if I did get a ride north, then bike south to Nha Trang, then at least the Saigon - DMZ ride would be 100% complete, rather than leaving that small gap below Nha Trang. The rest of the day's ride went without incident. I was at the Nha Trang turnoff by 2:15. Using the Lonely Planet map, I bicycled toward Nha Trang Beach. I started spotting Westerners and soon pulled over to ask about accommodations. Apparently Lonely Planet's favorite place was now a rip-off, but there were many alternatives. Eventually I checked into the Thong Nhat Hotel, an American-style motel just across the street from the beach. For $15/ a night, the Thong Nhat was a bargain; the other three hotels on the beach quoted $80 a night, $20 a night, and $30 a night. Westerners, hotels, cold beer -- I needed Nha Trang. I had left Saigon only six days earlier, but I was beat. Physically, but more so mentally. Each day's ride was more like a race to the next oasis. There was no flexibility -- I couldn't "stop and smell the roses." If I wanted to spend the evening inside, I had a set distance I had to make -- and it was always more than a hundred clicks. Just getting started every morning was like preparing for combat: helmet, because the drivers were crazy; earplug in the left ear, because the horns were incessant; sunglasses, to protect the eyes; gobs of sunscreen, because the sun was a killer. I'd already had two flat tires, and I'd had a nut shaken loose from my front pannier rack, necessitating a strapping-tape repair. I was finally learning to ignore the crazy driving, although there had been one close call. Earlier today a van passing a truck had almost taken me out. I never saw it happen. I did feel the van brush me, however, and it dawned on me moments later what had almost happened. Now I was in Nha Trang. For a little while, at least, I was away from the trucks, the horns, and the "Hey, what's your name?". That afternoon, two Australian bicyclists also checked into the same hotel. 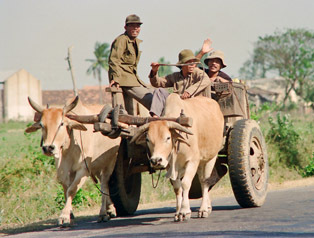 They had started in Hanoi, and were heading south to Saigon. We traded details that would make each other's trip that much easier. I grilled them about wind conditions. They commented that there hadn't been much wind since Hue. They told me about a nice place to stay about 80 kilometers north of Nha Trang, and I told them what I knew about accommodations to the south. I stayed only one full day in Nha Trang. Based on the wind report, I wanted to continue to push north, rather than hop the train, and I knew that I needed to keep moving before I reconsidered this whole trip! Other bicyclists continued to amaze me. The dark shadow betwen the two wheels: that's a man in a hammock, enjoying the one spot that's out of the sun. 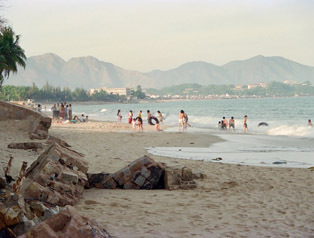 Nha Trang was the first town outside of Saigon with a tourist industry. 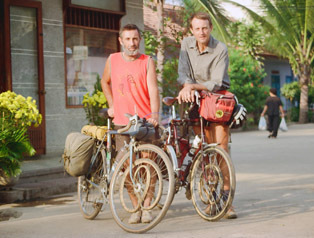 Two Australians I met in Nha Trang - they had been on the road for ages, and were riding throughout southeast Asia.